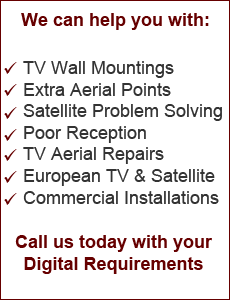 The Digital TV Aerials we supply are compatible with Freeview integrated TVs, Freeview and BT Vision set top boxes. We always check signal strength with our Profesional meter’s. Our standard digital TV aerial is by no means basic in terms of quality and will provide digital TV reception in most areas. Our installation vehicles carry a wide array of larger more powerful digital aerials should you live in a poor reception area. Multi-room systems can vary from an additional TV aerial outlet point perhaps in a bedroom, to a more complex TV system, incorporating multiple satellite receivers or satellite playback with remote control throughout your property. There is an abundance of combinations which is why we are happy to discuss your requirements and talk you through the options. We can arrange to have one of our engineers visit and explain the possibilities, discuss your requirements, and plan a system with you that meets both your needs and budget. Many satellite viewers are aware of sky multi-room, but with additional subscription charges this can become expensive. BBC freesat offers a subscription free alternative. There is an initial expense for the equipment but that’s it. Once installed, no monthly subscription and nothing to sign. Because the Sky and freesat service is broadcast from the same satellite, it is possible to combine both systems from one dish. Multi room satellite has never been so affordable. A full written estimate will be provided for your consideration. Estimates for new systems are totally free and without obligation. DAB stands for Digital Audio Broadcasting and is the future of radio broadcasting. It’s interference free and features a wide and varied choice of stations broadcasting both nationally and locally If you live in a poor signal area where the FM signal is barely audible, then digital audio may offer you better reception.DAB is a new technology which broadcasts audio and data services that can be received in over 85% of the United Kingdom. With the right kind of tuner, listeners can receive a choice of stations without hiss or fade unlike conventional FM and AM receivers. No matter where you are within our coverage area, you can listen to digital radio without hassle. The signal is either there or not at all DAB Radio offers listeners more choice of programmes from rock, pop, classical and easy listening, to spoken word news and more. So whatever your mood, there is always something on DAB Radio for you DAB Radio tuner/receiver required. Omni directional FM Radio aerials provide good quality local FM radio reception. We stock a wide selection of larger directional FM Radio aerials if your requirements include reception of stations that are not considered local or you reside in a poor reception area.